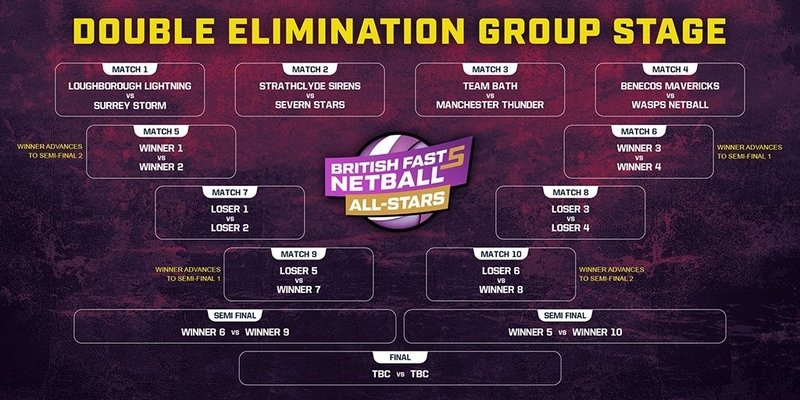 On Saturday October 13 the Fast5 All-Stars netball competition heads to the Copper Box Arena to showcase the most exciting tournament in British Netball. The teams are now confirmed and will feature defending champions Loughborough Lightning, Surrey Storm, Strathclyde Sirens, Severn Stars, Team Bath, Manchester Thunder, Benecos Mavericks and Wasps Netball. Some of netball's greatest players have flown in to fill All Star positions and combine with some of the brightest home-grown talent for the 2018 British Fast5 All-Stars Championship. Brand ambassador and newly-appointed director of netball for Surrey Storm, Mikki Austin, will also don the mid-court bib. The tournament features 12 minute matches, a five-point line for those brave enough to shoot from distance and a Golden Buzzer offering double points during their two-minute Power Play. Unlike traditional netball, teams are made up of five rather than seven players and shooters have the opportunity to net long-bombs from a five or three-point zone, or they can play it safe for one point under the net. All eight teams will play at least two games across five hours as they battle it out and see who will take home the title, the trophy and the £25,000 winner's cheque. This Sunday sees one of the highlights of the British Basketball League season take place with the All-Stars Championship at the Copper Box Arena, London. Eight of the BBL’s best teams will compete in one of the most exhilarating tournaments in sport. Each match will last 12-minutes, with features such as an all-star 5-point line and a Golden Buzzer Power Play promising an incredibly action-packed afternoon, showcasing some of the finest basketball talent the UK has to offer. Defending champions London Lions will be joined by BBL treble winner Leicester Riders, Esh Group Eagles Newcastle, Glasgow Rocks, Surrey Scorchers, Bristol Flyers, Worcester Wolves and DBL Sharks Sheffield. The draw for the double elimination stage of the British Basketball All-Stars Championship has been made, with London Lions to open their title defence against Worcester Wolves. The second match of the afternoon will see Bristol Flyers against Surrey Scorchers before Radisson RED Glasgow Rocks take on Esh Group Eagles Newcastle. Finally, the draw pitted Sheffield Sharks against Leicester Riders in match four. The tournament begins at 1pm on Sunday, October 14th at the Copper Box Arena, London and will be broadcast live on Sky Sports Arena and Sky Sports Mix throughout. 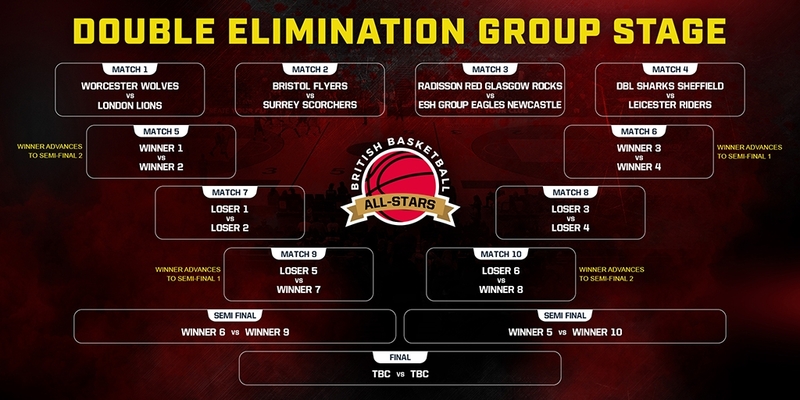 The British Basketball All-Stars Championship starts with a double elimination group stage comprising a total of ten matches. Win your opening match and you’ll face another winner for a place in the semi-finals, while teams who lose their opening matches face off to remain in the competition. After each side has played two matches, those with one win and one defeat play a third match with the winner advancing to the final four. London Lions won the inaugural British Basketball All-Stars Championship last year, beating Newcastle Eagles 26-25 in an enthralling final. Justin Robinson was MVP on the day and Lions will be hoping he can help fire them to a successful defence this weekend.